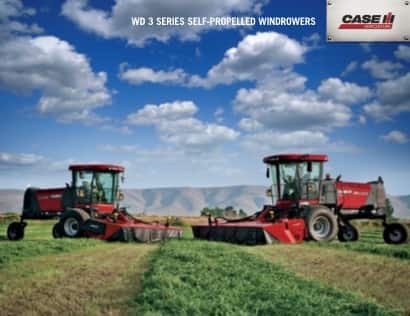 3 Models, 14’ 3” - 18’ 3” Cutting Widths: Case IH HDX 2 series sicklebar headers, built for heavy crop conditions, use the counter-stroking action of dual sickles to shear crop cleanly while the unique floating auger keeps the crop moving smoothly to the conditioning rolls. The Case IH HDX 2 Sicklebar Hearder uses a counter-stroking action of dual sickles to shear crop cleanly while a unique floating auger keeps the crop moving smoothly. The HDX 2 Series Sicklebar Headers feature a conditioning system that is built to work in heavy crop conditions. Conditioning rolls crimp stems thoroughly for fast dry down. The roll pressure system uses a torsion bar, which allows conditioning rolls to automatically separate to clear slugs and the chevron pattern provides even windrow formation. 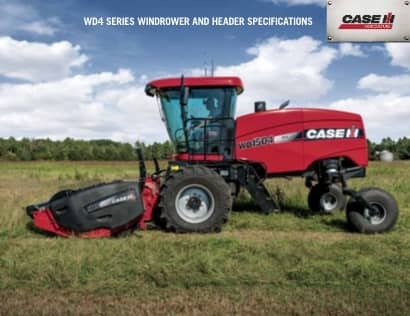 For quality harvesting results, combine the 14 ft HDX142 Sicklebar Header with a Case IH WD4 self-propelled windrower. Treat your hay to smooth cutting and gentle handling with the 16 ft HDX162 Sicklebar Header. The 18 ft HDX182 Sicklebar Header provides quality cutting at uncompromised speed for even heavy crop conditions. ​Configure and price your new Sicklebar Header. Customize it the way you want.